iText 7 : What is the connection between LTV and document timestamps? How do I make a PDF document LTV enabled without using timestamps? I have read the paper, discussions but there is one thing still unclear. What is the connection between LTV and document timestamps? Or more precisely, how do I make a PDF document LTV enabled without using timestamps? One thing I know for sure, to make an LTV enabled document, I do not need timestamps. I tried signing a document with a digital certificate in acrobat and when opened it says the document is LTV enabled, I did not use any timestamp. LTV enabled means that all information necessary to validate the file (minus root certs) is contained within. "a valid CRL or OSCP response for every certificate" also includes signatures over CRLs and OCSPs, not just the signature certificate. LTV may be enabled when all collaterals are embedded in the signatures and not DSS (I just fixed a bug that did not handle this case correctly). In this case there may be no DSS. However, this is very unusual, because signatures over CRLs and OCSPs do not contain embedded rev info which is Adobe extension. Yet, this is a distant possibility. Thus, it had been assumed sometimes that each time you add DSS you also have to add a document time stamp. This in turn may give rise to some hen-egg issue because the time stamp also relates to some certificate for which additional DSS information might be required. As Leonard also wrote back in January on the topic of "DSS for LTV-enabled"
No timestamp (regular or document level) is required. 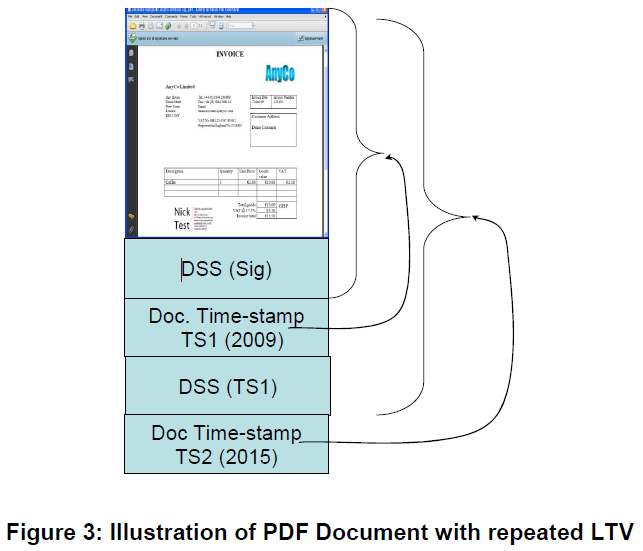 Or more precisely, how do I make pdf LTV enabled without using timestamps? Add validation information for all involved certificates except root certificates, also including certificates used in the validation information. And whenever you time stamp, add validation information for the time stamp, too.